A beautifully executed Basketmaker petroglyph of what appears to be a large crane, hidden in one of the many canyons of Comb Ridge. With this photo I tried to convey the perception of the crane in flight by using the natural striations in the sandstone. The small curved step in the sandstone below the large bird gave me a nice lower frame for the scene, as well. 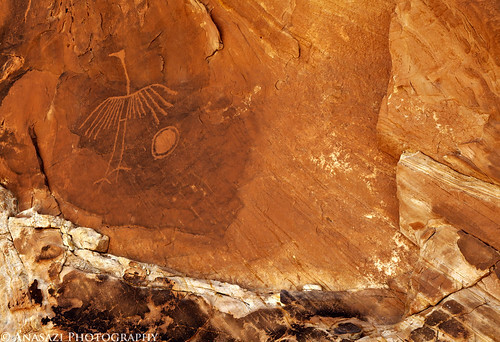 Comb Ridge holds many secrets for those willing to explore it, and this large crane petroglyph is surely one of the numerous exceptional ones!